Life was looking bright for male Red-backed Fairy-wren near Jacana hide in Townsville Common. Quiet patch, no worrying competitors, industrious partner. Nest built, two eggs laid. Then. Grass nest robbed overnight. Dastardly snake in the grass. Bury one's head in grief? That's not the way in nature. Just got to get on with grooming and life. Also getting on, companionable White-lipped Green Treefrog, resident of Payet's Tower viewing platform. Resident indeed for so long it's initiated colour change to better match shaded interior on the upper deck of the tower. Change also elsewhere in the conservation park. White-bellied Sea-eagle pair had mighty nest in dead tree collapse a few months back. After some delay new building began. Nothing so grandiose as previously, but they're calling it home and may even have laid first egg therein. Time will tell. Burton's Snake Lizard found across track yesterday in Townsville Common Park carried big surprise. The wizard lizard coughed up multifolded Keelback snake longer than its digestive track. Lizard loses big meal. Keelback loses everything. Fly attends feast. Tell me, Egret, what's your secret for catching fish? Carry four youngsters under your arms? No problem, if you're a male Comb-crested Jacana. Spotted bulky bird on lagoon in Palmetum Botanical Gardens, Townsville, with too many legs, but only two on water plants. Seconds later four young Jacanas were free to forage with father (females free of parenthood). Make all four vanish in a flash? No, problem. Male uttered shrill orders and the quartet disappeared into debris beneath him (above) on edge of lagoon. My short, very careful search found not one bird. But it caused male to flop 'broken' wings and splosh invitingly about - an easy meal for a predator. Soon after, perceived danger passed, male sounded the all clear, picked his 'invisible' four up, and carried them to other side of lagoon. Sticks. Some birds need stacks of them. 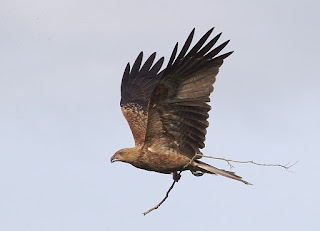 Whistling Kite returns towards nest after seeing off cheeky young Brahminy Kite that ventured too close. But on the way home, why not stop off for a bit of extra for the relatively modest nest high in eucalyptus? Young White-bellied Sea-eagle not so long ago stood upon stack of sticks vastly outweighing the kite's. Parent birds lately heard honking from their massive creation in Townsville Town Common Park. Be no surprise soon to see them carrying fresh stocks of sticks to the nest. Then there's those that stick to standing stock still on sticks. Nankeen Night Heron, in early morning light, for example. Or Little Pied Cormorant. Pheasant Coucal not sticking totally to the theme, half on, half off. White-bellied Cuckoo-shrike goes one better, all on and all off. Little Friarbird, meanwhile, sticks to daily preening routine, stock-in-trade for all birds whether from the sticks or the heights. Can be thankless job trying to help travelling birders find that one species they're chasing. Some bogey birds seem always to be there yesterday and tomorrow for those desperate to see them and ever here today for those trying to help. Thus, Horsfields Bushlark amid samphire this morning beside road to Bald Rock in the Townsville Common. One of six for me, yet seemingly a species unsighted in three mornings by English visitors. Also in the same patch - and worthier image - Australian Pipit ruffling plumage after skiff of rain whizzed by. Tawny Frogmouths come high on some lists of must-sees. Female in small paperbark in Pallarenda Conservation Park yesterday watches unseen, often with male partner, as visitors come and go. But no guarantee that two directed to the site today will have seen the bird/s. More generally many would love to capture Rainbow Bee-eaters - in all their splendour. Finding the birds isn't the problem. Finding them in exactly the right place (low down, close up, in focus, cleanly backgrounded) not so simple. Above image close as I've come for several months. Two out of four ain't bad.